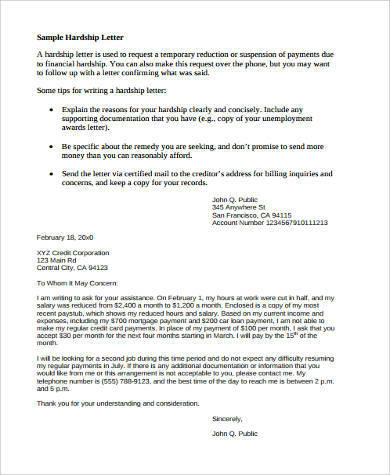 Financial hardship letters are often written when requesting for a modification of a loan, or of a settlement of payments or debts. 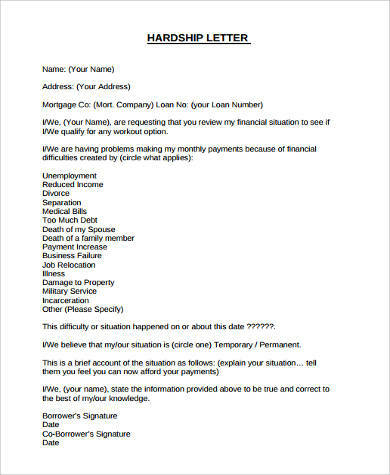 It is an explanation of your financial distress, and your incapacity to pay. 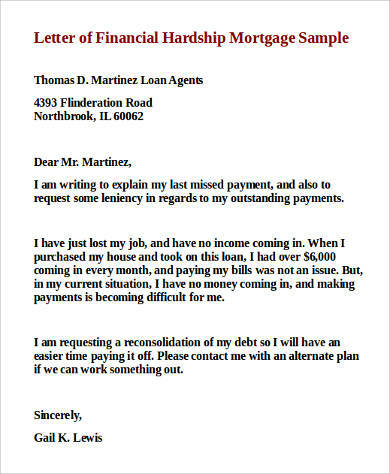 When in deep financial struggle, an approved financial hardship letter may be your only hope. It saves you from a lot of trouble and further difficulties, and may ease the financial obligations that you already have on your plate. It becomes a crucial document that should be written effectively and well. Be guided with these Sample Letters, and give your letter a lot of preparation and thought. 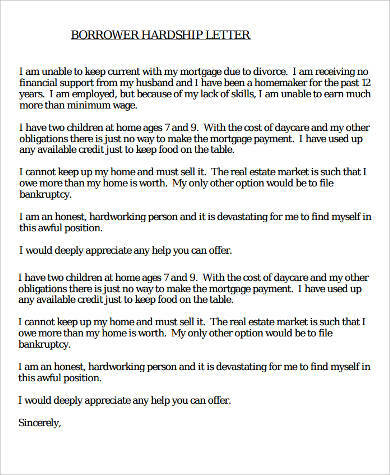 You are essentially making an appeal with your financial hardship letter. You are asking for assistance from involved financial institutions to somehow help ease your existing money woes. the incapacity to pay medical bills. 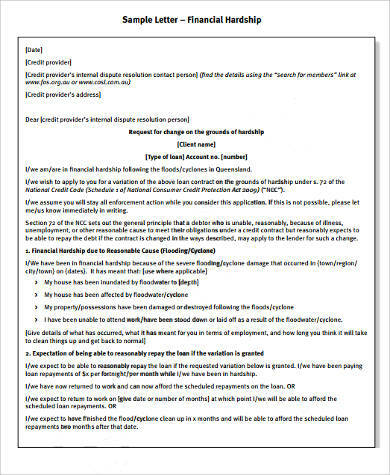 As you appeal to involve financial bodies on the problems you are facing, be sure to remember that your financial letter still has to follow a business or professional format. 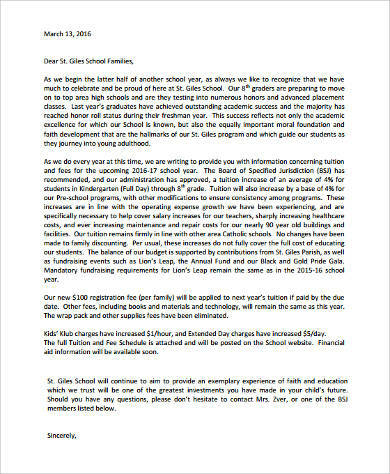 This document will go through and be assessed by decision-making individuals. Start it by addressing the recipient/s accordingly, and end it with your name and your contact details. 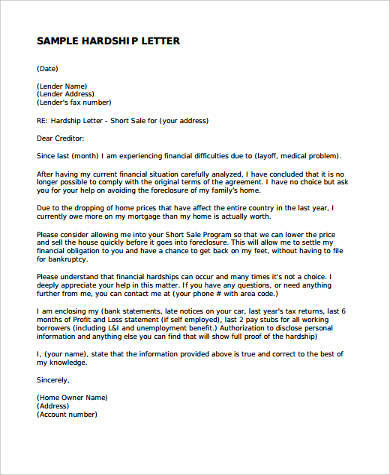 Be guided on the format with these Sample Hardship Letters. More importantly, write a concise letter. 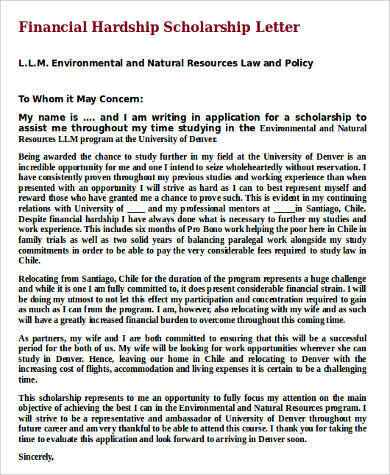 As much as possible try to fit your appeal in a single page, otherwise you may lose the attention and the interest of your letter’s recipients, diminishing your chances for approval. Be honest and detailed, but go directly to your point. Try to do away with unnecessary bits of information to your case. Your request. Specify the help that you need. For instance, a decrease in your monthly payments for a loan for a stretched out payment period, or a recalculation of interest rates. Your hardship. Explain honestly the reasons why you are struggle financially. Underline: honestly. Do not subtract or add anything. Financial difficulties are faced by a lot of people. In particular, the inability to pay certain obligations is frequent in medicine and health care. Medical treatments and surgeries cost a lot of money. 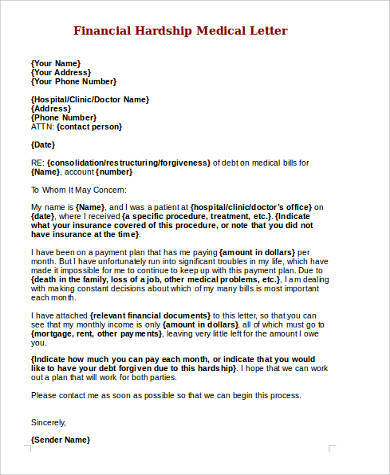 For those who are unprepared for medical emergencies, have no medical plans, or for those who just do not have the money to spare for expensive medical bills, their last hope for a settlement is to make an appeal via financial hardship letters. These documents are their appeals for help. 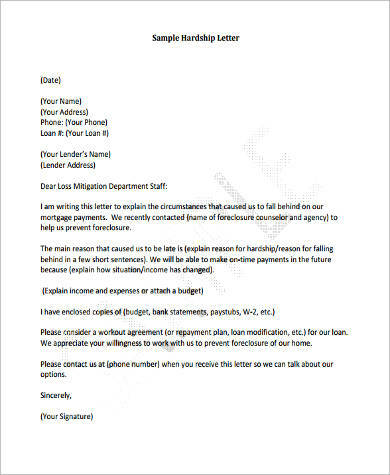 Write yours with the help of these Financial Hardship Letter Samples.